Thanks to Fab, who agreed for posting. this fantastic prize. The winner will be announced on january 14th 2007. The winner will get a personal E-mail. of the Prince site from wich u compete in this. Please do not enter this competition if you already possess this item. Give somebody else the chance to win this item. The 12" promo vinyls where a lovely gift 2 ItAintOver by Universal studio's. Thanks a lot 4 this uportunity 2 make some real fans happy ! Don't sell the LP and if u already have him and please give others a chance 2 win this collecters item. If u dont want it dont join the give away. Keep the give aways free and fun. ItAintOver is an unauthorized, unofficial, independent dutch fan site. NPG Music Club, Columbia Records, Sony Music Entertainment Inc, Universal music Group, or any other Prince Rogers Nelson related organisation. zaznaczając nick jakim się posługuje na tym forum. 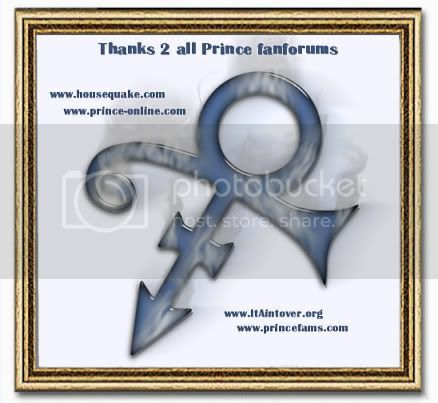 the give away is on different prince forums, all for the same time periode. The first mailer was ElectricMan i will contact him for the way we gonna handle this. Congrats, with this great purple vinyl. and all the others thanks for mailing. but i have a Q for Jan.
is it like that, that EM won because there were not 15 people taking part in this competition? please explain it here, so that everything will be clear for me and others who didn't win..
i don't want to see here fights, greed or etc. I tought it was clear when i posted this. But, yes there where only 3 mails, so i when i followed my own rules, then this purple vinyl goes to nobody. So, everything now is very clear. I will contact the other two mailers soon, i gott something for them aswell, from my private collection. let us know if you recieved this one already?? and for the other two mailers a nice surprise will come to you, thanks to the Carolinah who will send these nice things. But I don't have "hardware" to listen to this vinyl . Fab: jesli napisalem cos zle to popraw moja angielszczyzne. Don't you dare to listen to this stuff!